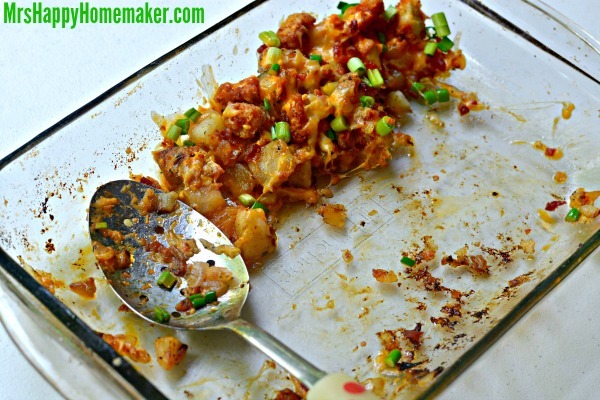 Buffalo Ranch Boneless Wing & Potato Casserole - SO GOOD!! 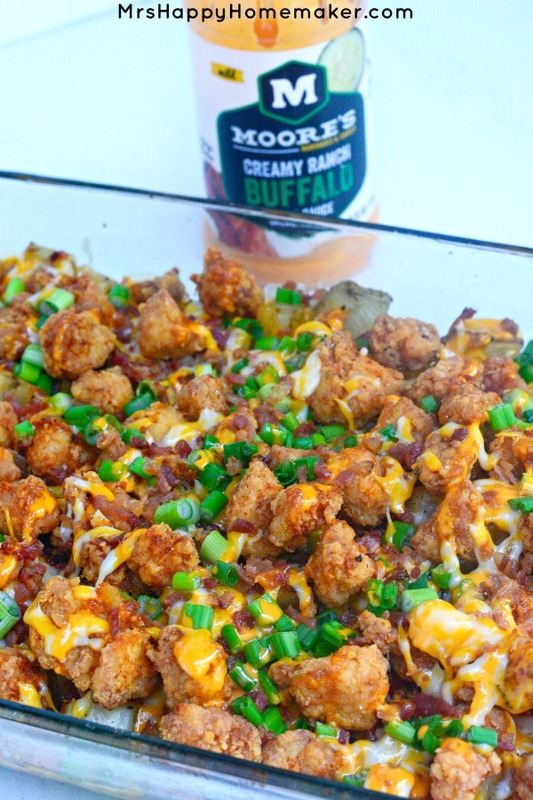 My Buffalo Ranch Boneless Wing & Potato Casserole is so delicious that it’s beyond words. 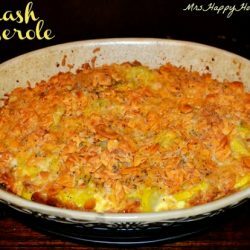 My family gobbles this easy dish up & raves every step of the way. Let’s talk about awesome things for a minute. Cheese is awesome. Bacon is awesome. Chocolate is awesome. Dogs are awesome. Cats are awesome. Kids are awesome (sometimes haha). New shoes are awesome. Y’all are awesome. So many awesome things are awesome – it’d take far too long to name them all. 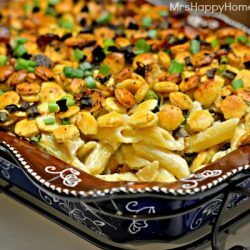 This recipe is fantabulous. Is that even a word? Maybe it is because my spell checker didn’t give it one of those red underline things…. if it’s not really a word, let’s just all pretend it is for a moment because this recipe is deserving of such a term. I’ve gotta say it again. This recipe. This recipe is full of awesome. Buffalo & ranch. Fried boneless chicken. ‘Taters. Bacon. Cheese. Love. My family devoured this. I heard lots of ‘make this again soon!’, ‘I want this for my birthday meal!’, & ‘more please!’ – all the sounds of recipe success. This one was definitely a winner. Hands down, all around – everyone fell in love with it! …my daughters attacked it one more time. Then, it was g-o-n-e.
First, take about 6 to 8 cups of diced potatoes (you can peel them or leave them with the peel on, whatever your preference) & place them in a 9×13 casserole dish that’s been sprayed with non-stick spray. Season with salt, pepper, & garlic powder. 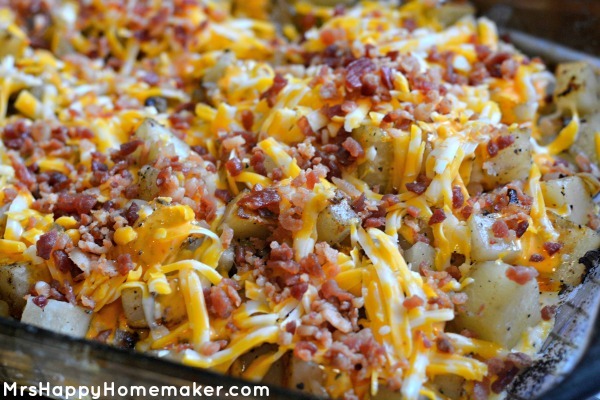 Drizzle with a little bit of olive oil – or place a few pats of butter equally around the potatoes. Cover with aluminum foil, Bake at 350 degrees for 1 hour. The star of this show? 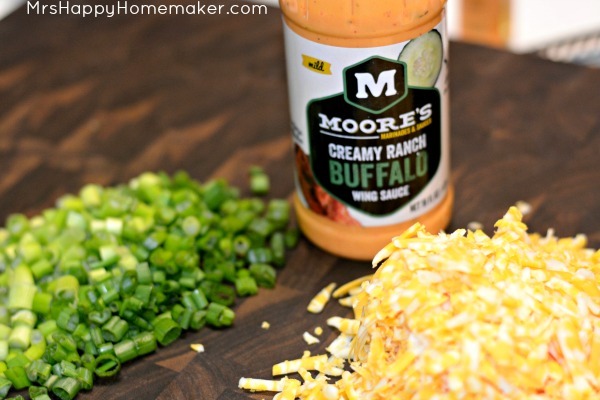 Moore’s Marinade has a brand new sauce called ‘Creamy Ranch Buffalo Wing Sauce’ – and oh my gosh y’all, it’s divine! It’s a fabulous dipping sauce for chicken tenders, coated on wings, as a dip for chips & celery (trust me on this!) 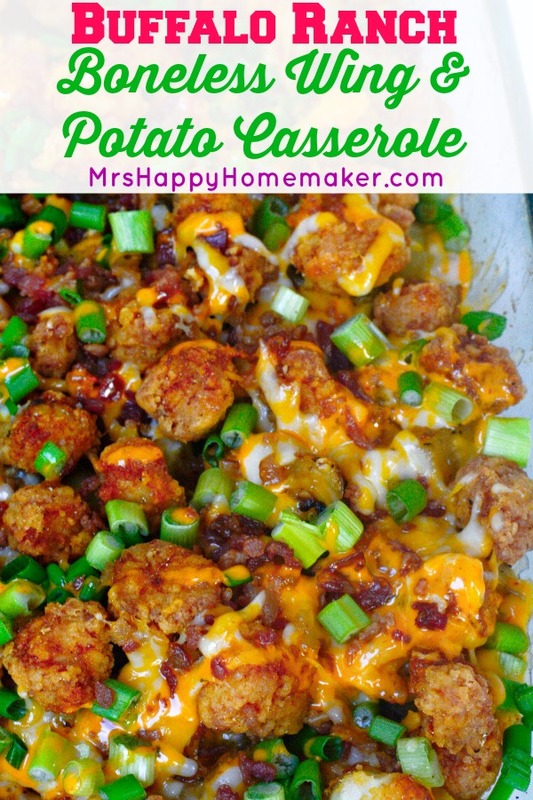 & even Moore yummy in this casserole (see what I did there?). You should be able to find it at your local grocery store, we have it at my local Wal-Mart – click here to see where else you can buy it. While the potatoes are cooking, marinade 1.5 pounds of the chopped chicken breasts in 3/4 cup Moore’s Marinade Creamy Ranch Buffalo Sauce for 30 minutes. After they’ve marinated, don’t drain the marinade. 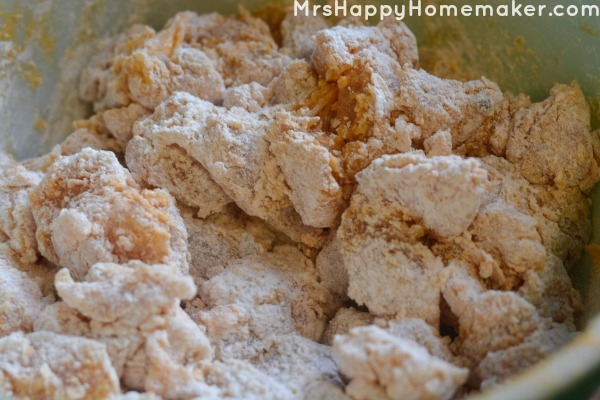 Mix in 1 to 1.5 cups of flour, enough to coat the chicken pieces. 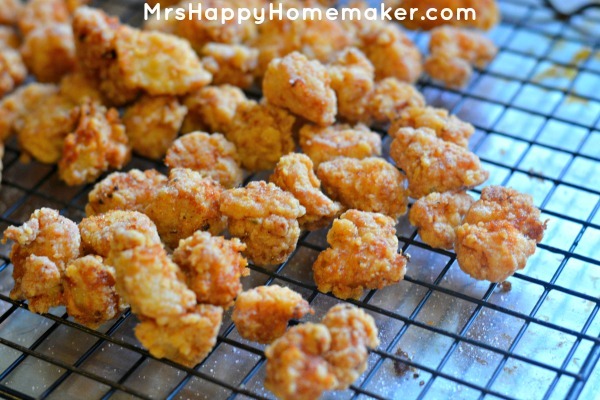 In a deep fryer or hot oil in a skillet, fry the chicken pieces until golden brown & no longer pink inside. Drain on paper towels or a wire rack. The potatoes should be about done by now. 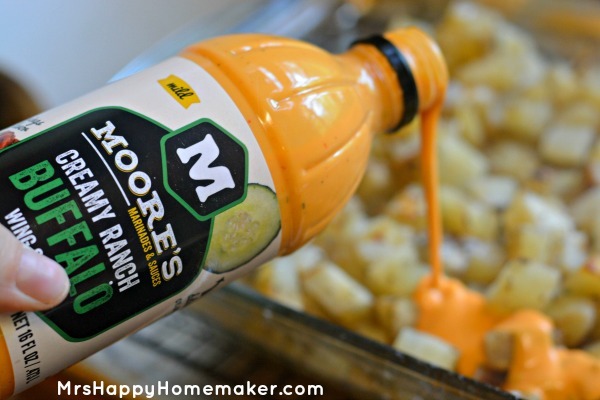 Remove them from the oven & pour 1/2 cup of the Creamy Ranch Buffalo Sauce evenly over top. 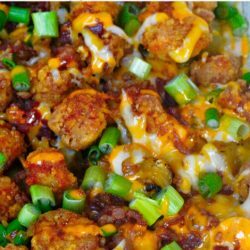 Sprinkle with 1 cup of cheese & 3/4 cup of bacon bits. 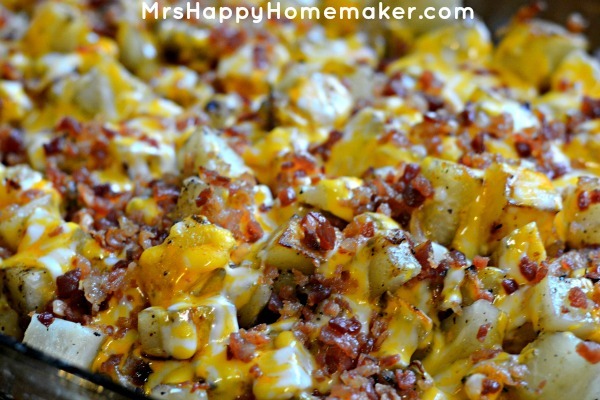 Give it a little stir to evenly distribute all the bacon & cheese & sauce goodness. Sprinkle the chicken pieces on top. 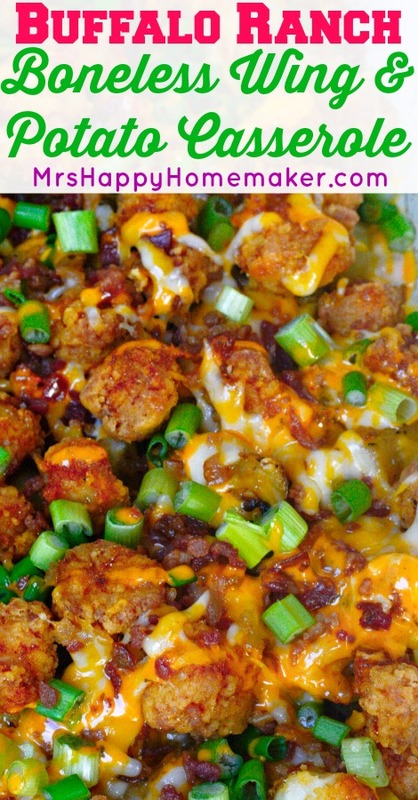 Sprinkle with 1 cup of shredded cheese & a 1/4 cup of bacon bits. Drizzle a little extra Creamy Buffalo Ranch sauce on top. Bake for an additional 5 minutes, or until the cheese is all melted & lovely. Oh. My. Goodness….. I can’t even describe how delicious this meal is. It’s beyond words…. because if this is around, you’re mouth is gonna be full & you won’t be able to speak. You’ll just be shoveling it in. Trust me on this! You’ve gotta make it!! Spray a 9×13 pan with nonstick cooking spray. 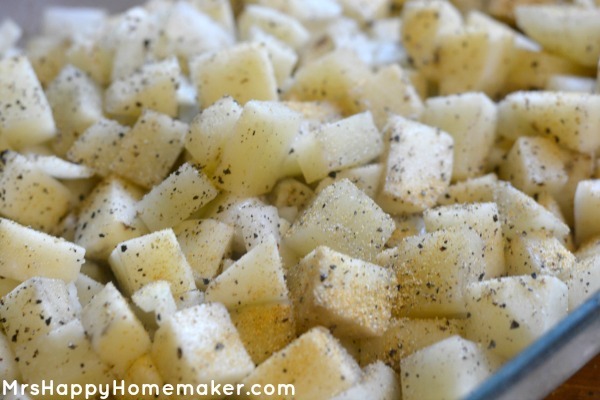 Spread the diced potatoes into the dish. Drizzle with olive oil, or spread a few pats of butter over top. Season with salt, pepper, & garlic powder to taste. Cover with aluminum foil. Bake for 1 hour. Meanwhile, marinade the diced chicken in 3/4 cup of the sauce for 30 minutes. After it’s marinated, do not drain the marinade. Stir the flour (1 cup to 1.5 cups) into the mixture until the chicken is thoroughly coated. Let sit for 5-10 minutes for the flour to adhere to the chicken. Fry in hot oil until golden brown & no longer pink inside. Drain on paper towels or on a wire rack. Season with salt to taste. When the potatoes are done, remove them from the oven & remove the tinfoil. 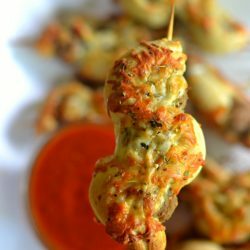 Drizzle with 1/2 cup Creamy Ranch Buffalo Sauce. Sprinkle on 1 cup of shredded cheese & 3/4 cup bacon bits. give it a little stir to evenly distribute it. 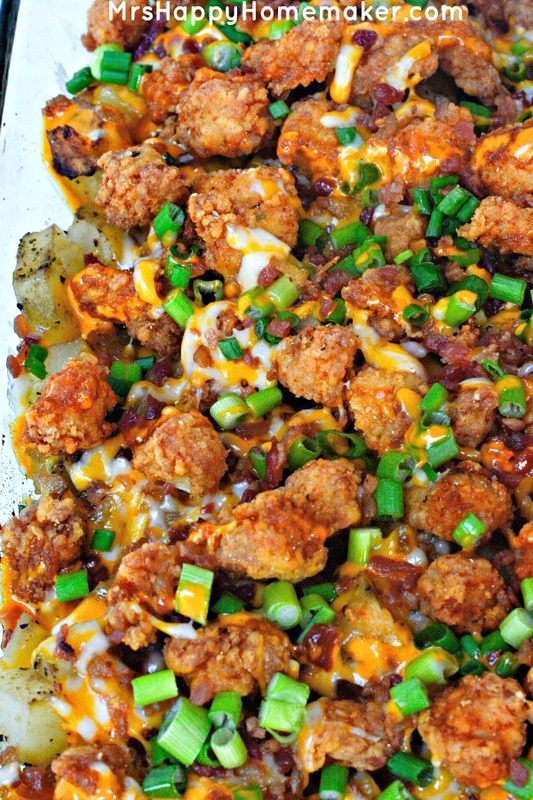 Spread the fried buffalo chicken pieces on top of the potatoes. 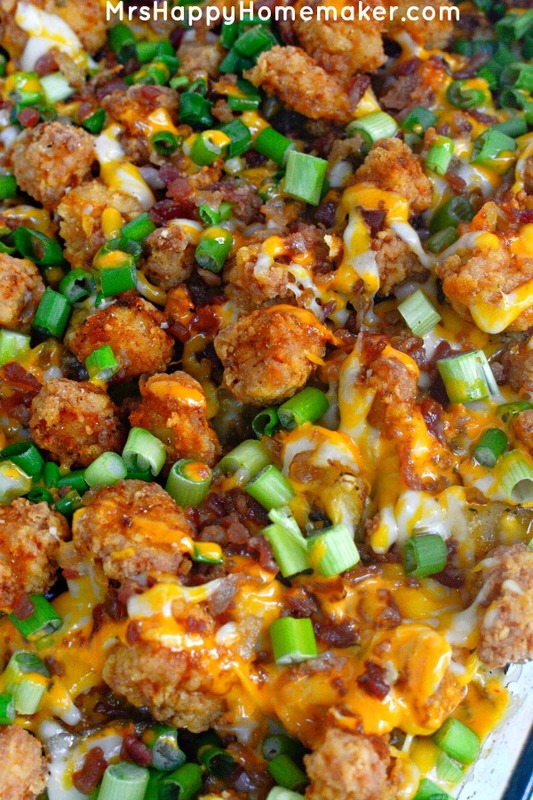 Top with the remaining cup of shredded cheese, 1/4 cup of bacon bits, & another 1/4 cup of creamy buffalo ranch sauce. Bake, uncovered, for 5 minutes – or until the cheese is melted. Top with diced green onions. I was compensated by Moore’s Marinade for creating this recipe. All opinions & general ramblings are my own. Looks good buy my household does not like buffalo sauce. Wonder what I could use instead. You could do it entirely with ranch if you like. The Creamy Buffalo Ranch Sauce doesn’t taste like your typical buffalo sauce at all though, so you may just like it. make it but use just plane ranch or ceaser dressing, I think it would give you the same idea without the bite. We don’t have the Moores sauce in Canada…any suggestions on substitutions? You could try half buffalo sauce & half ranch dressing instead. Too bad it isn’t sold though, it’s SO good! My prayers go out to you and your family during this time of trial. I will be sure to share your blog so you can focus on its continued success in the days to come.